Firstly sorry to the readers and to Lizzie from the Garden Share Collective for my tardiness in writing this post. We have been on a wonderful holiday, driving across Australia for Christmas and my Mum’s 70th birthday celebrations. December’s deadline passed in frantic preparations, and January was spent away. I did, however get to take some quick photos of the garden before I left, and photos from the same angle after we returned. The other blessing was wonderful friends and neighbours who kept the watering going, and hopefully enjoyed the eggs and fruit. At the moment I am picking zucchini (nine huge ones when I returned), bok choy, radish, mizuna, squash, onions, and cabbage. I’m also picking some Brussels sprouts, but they are so aphid challenged that I haven’t brought myself to eat any yet. On the fruit front I picked the very last apricots (we missed almost all of them while on holidays), gooseberries (the gooseberry sauce I made was great with duck), and citrus. 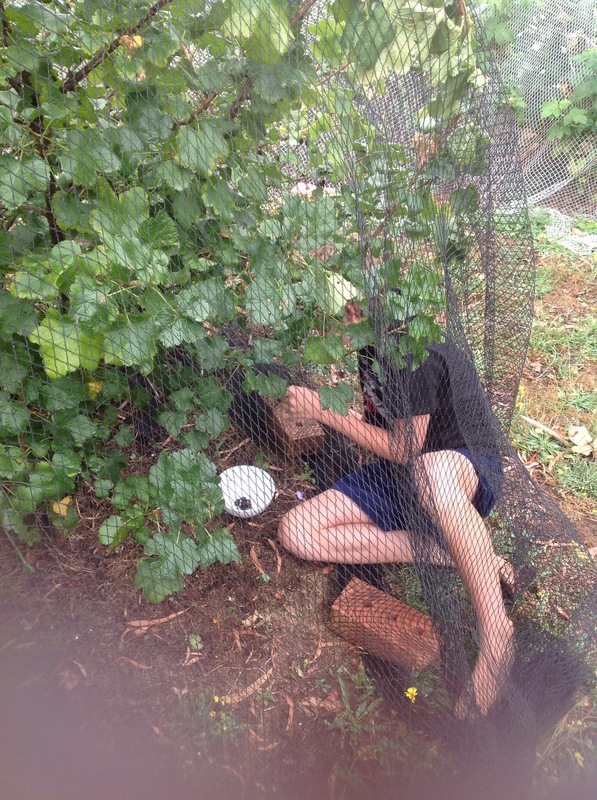 Here is the Aunty Collector, collecting gooseberries instead. 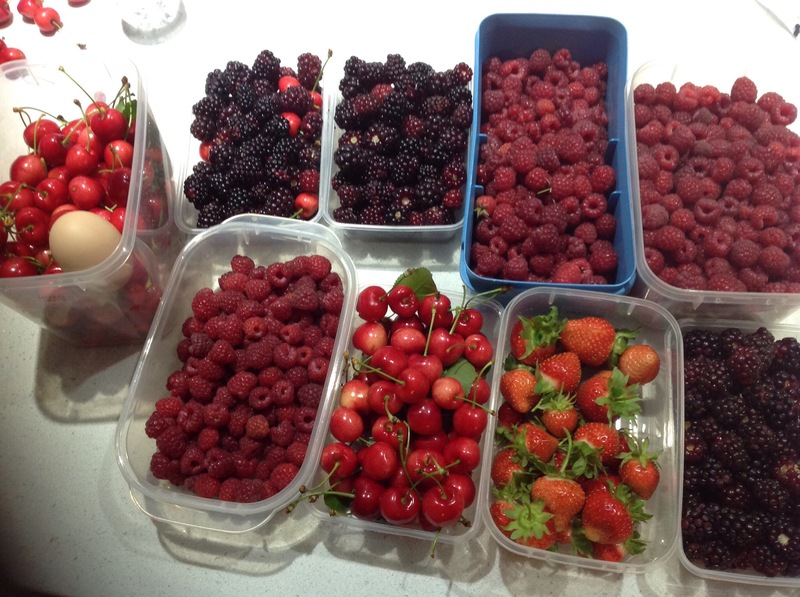 Before we left we enjoyed kilos of raspberries, cherries and blackberries, and I’ve frozen a lot of them. I have planted more beans (the rabbits enjoyed the last seedlings), and more carrots, having read an article on how much chemical goes onto a commercial carrot. I’ve read that I should be pruning my cherry and apricot trees at this time of year, so I’d like to do that this weekend, as well as clean out some things that are finished, like the last few cabbages. 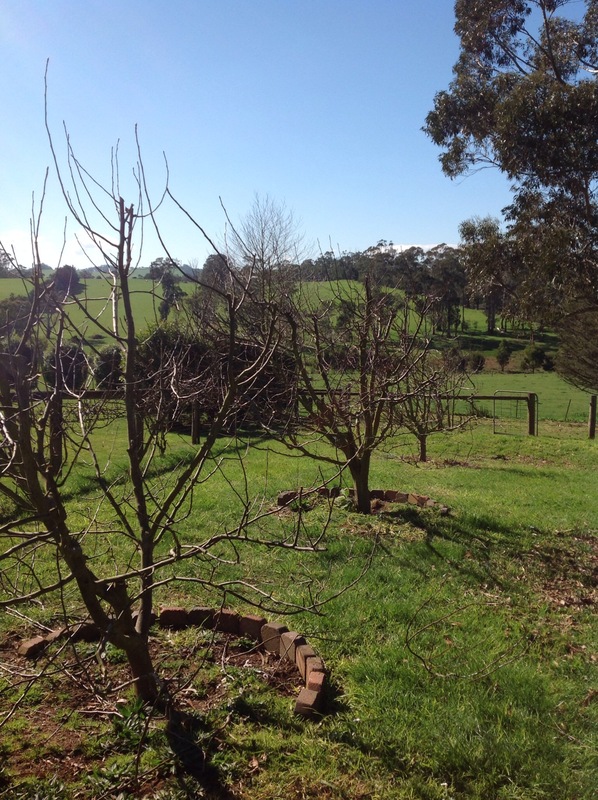 We also need to net the pear trees. Sadly it is too late for the apples. Parrots came and took the lot while we were away, according to the neighbours. 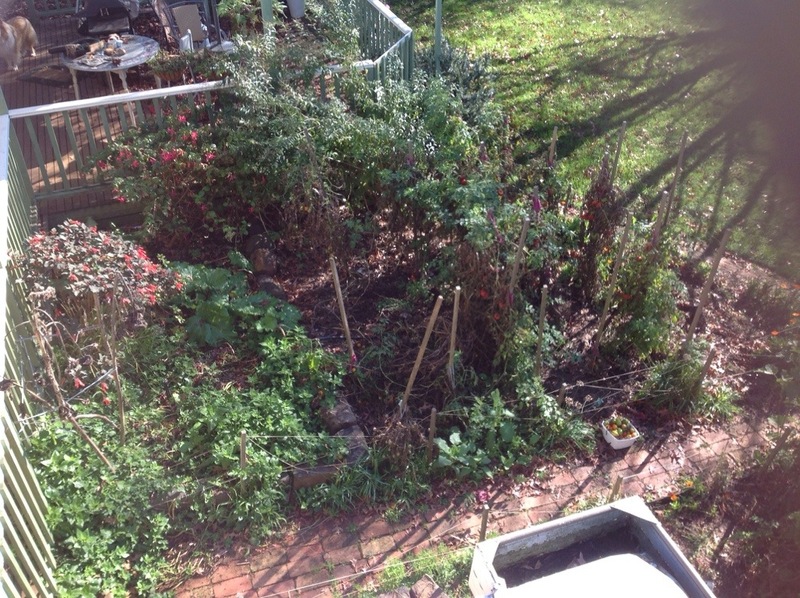 Finally here are some before and after shots of various garden beds. 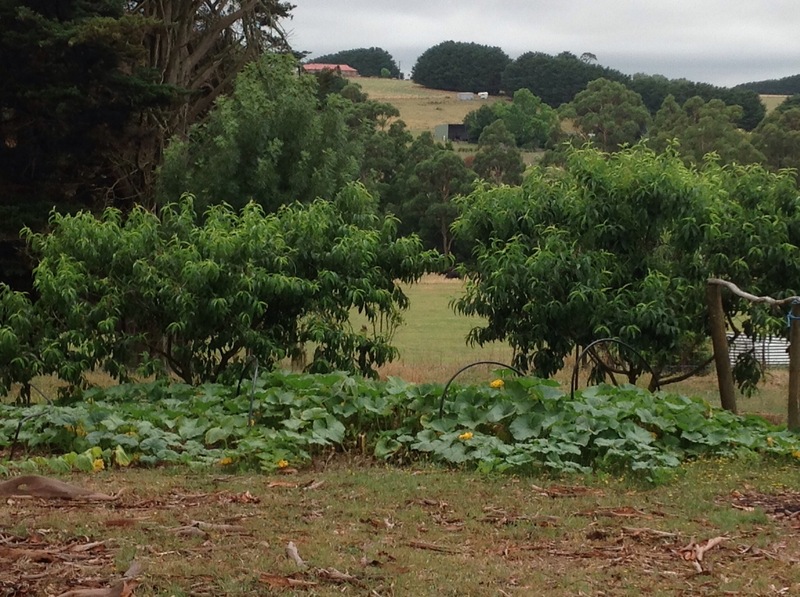 The pumpkin patch, with view which remains beautiful with no work from me! Firstly, let me state from the outset that I love Mr Gorgeous. He has been co-working with me in the garden, and the result are far more than double what I could achieve alone. He keeps me out there when I could lose interest, he works like a Trojan, and he is much stronger than me, so big jobs get done. Not only that, his interest spurs me on during the week. So, this weekend, we have been doing a big spring clean. 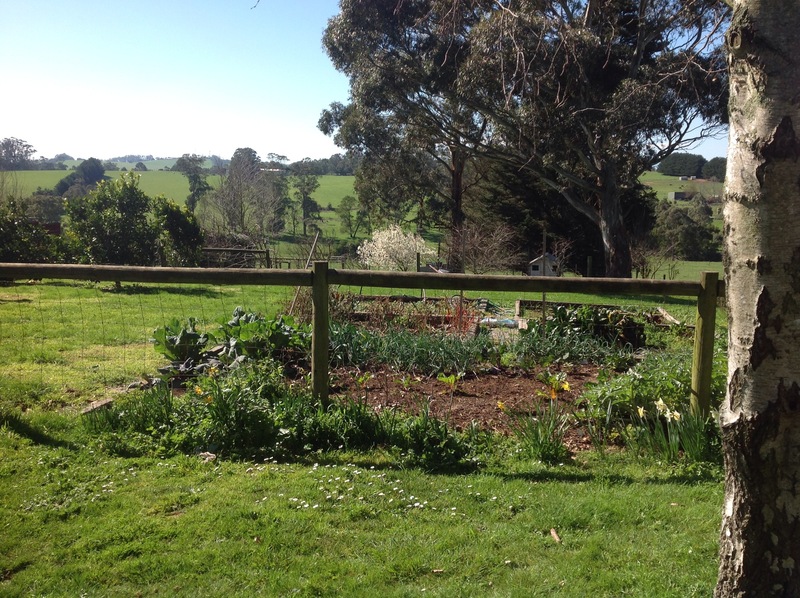 Horse poo has been shovelled, beds have been weeded, planted and mulched, and the summer veggie patch is starting to take place. 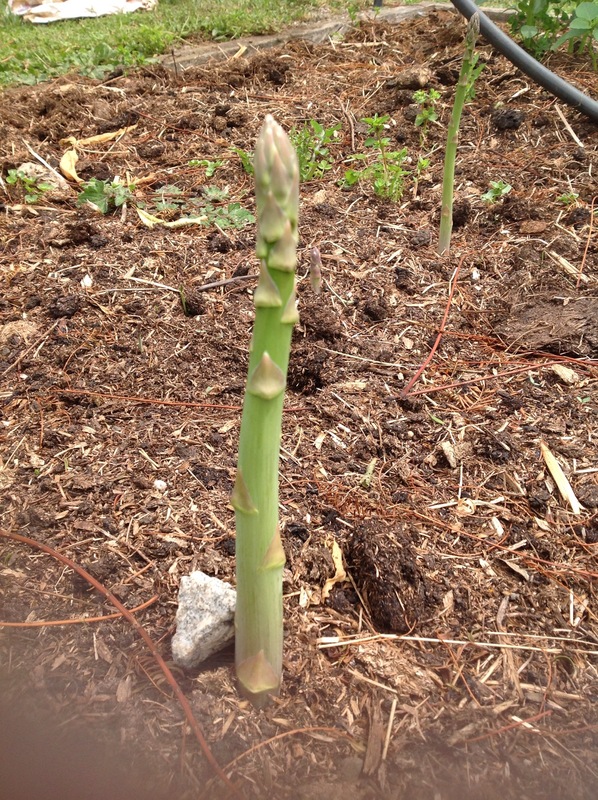 The asparagus is going well. I get about a bunch a day, which means enough to eat it for a side veg every couple of days. 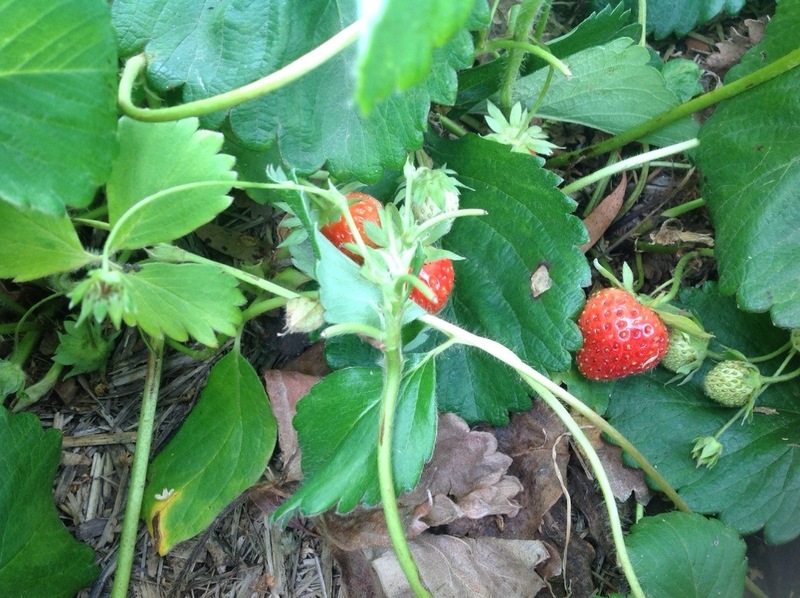 The strawberries, which are now netted, are producing the first red berries, although they are not super sweet yet, compared with last year. I transplanted them quite late, so they are not as robust as usual. 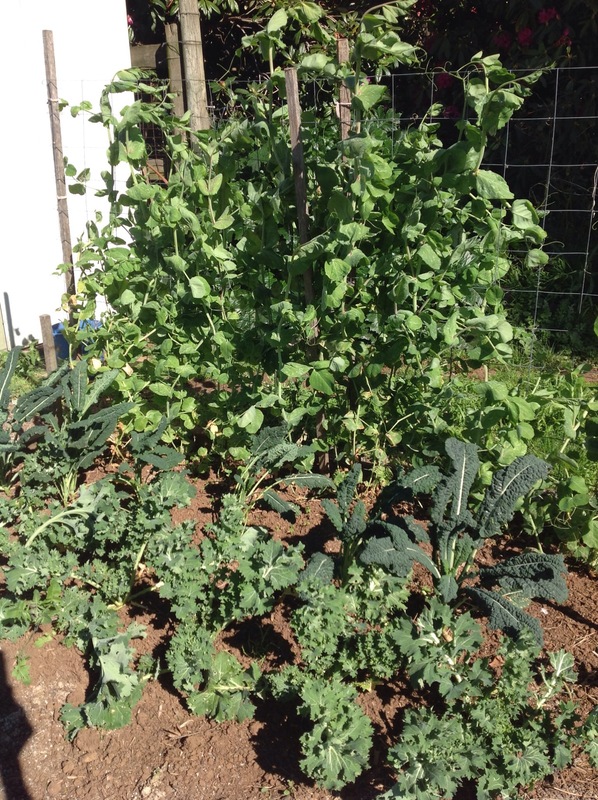 In the other beds we have been getting a steady supply of kale, silverbeet, and snow peas. I also picked and bottled a batch of beet root. 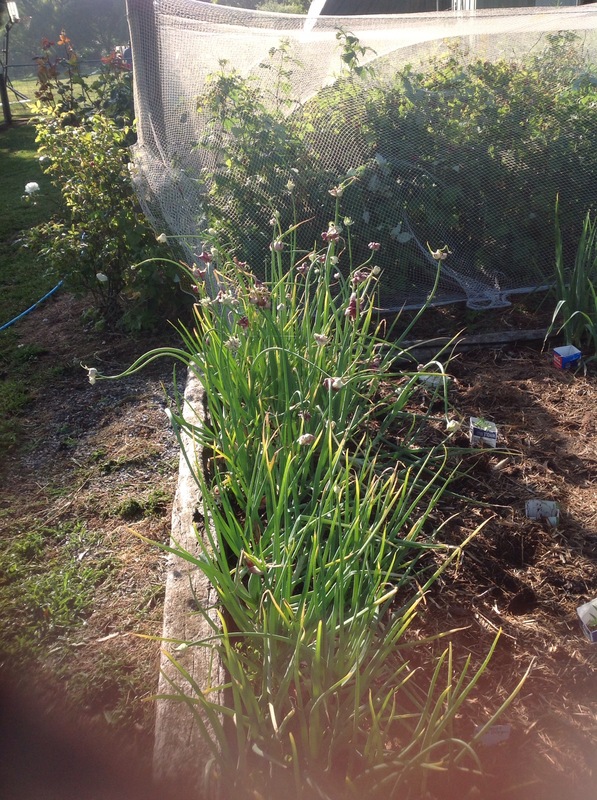 Also, the onions are doing super, and I’m picking heaps. I’m picking them green and using the stem and whatever bulb there might be, because they are all self seeded from last year, and I have no clue which will set bulbs, and which are spring onions. The leeks, at least, are easy to spot. Going in at the moment are tomatoes, tomatillos, capsicum, corn, beans (in industrial quantities, because I can’t decide which variety to grow), pumpkins, melons, chillies, zucchini, cucumbers and leafy greens. 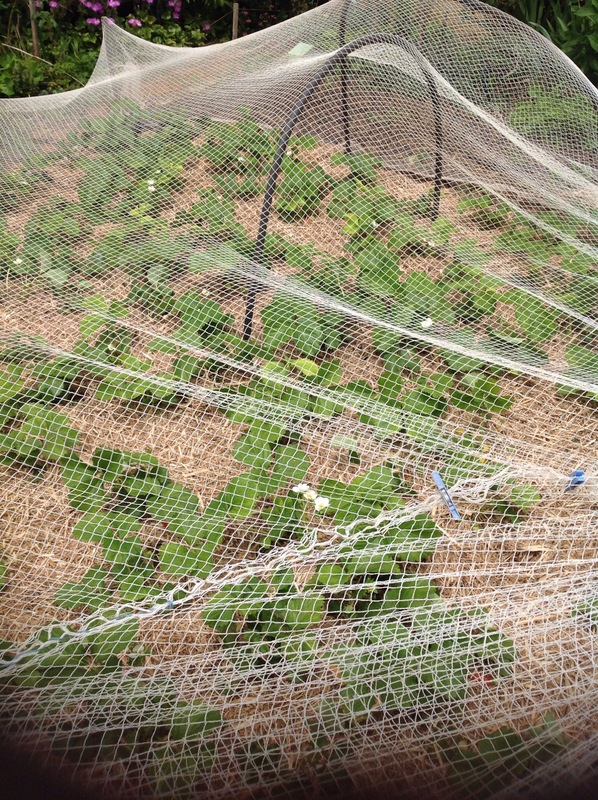 Below are pics of the pumpkin patch, which has chicken visitors, and the seedlings, which are fewer in number now than when the picture was taken, because some have gone into the ground yesterday. Keep planting. 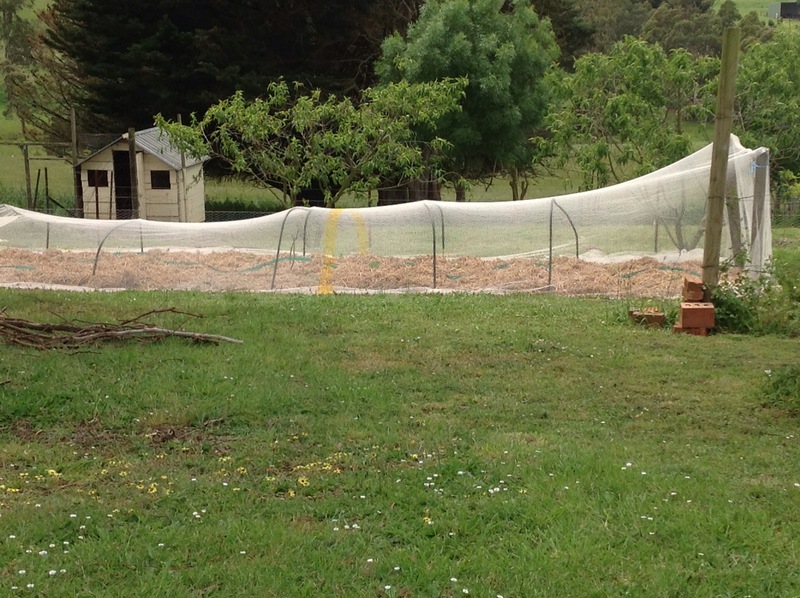 The rest of the seedlings need to go in, and I should start another batch of greens in punnets. Sort out the reticulation for summer. Mulch everything. I would like to look over my seed catalogues and check I haven’t missed anything. Net the fruit trees and berries. 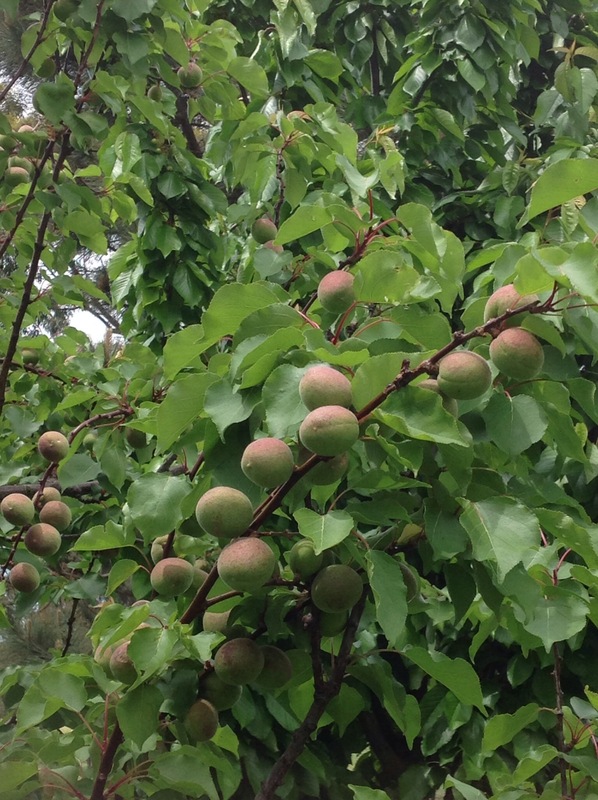 As you can see, we have a lot of fruit coming. 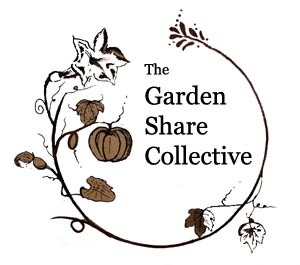 If you enjoy reading about growing food, why not visit some of the other gardens in the Garden share Collective. There are some wonderful gardeners out there with great ideas. Honestly, I thought I’d never get back into the garden. The weather has been miserable, the weeds had grown high, and Mr Gorgeous has been too busy to be of any moral or practical support. I’ve been dashing past on the way to the chickens, trying not to look at my weed strangled vegetables, or the rabbit damage. Fast forward to last week, when my lovely friend Jenny came and weeded with me for the day. She and I spend occasional days in each others’ gardens, chatting about books and children and life in general, while we prune, or weed, or plant, or whatever needs doing. Never has it been more appreciated than this week, when we cleaned out no fewer than five vegetable beds in need of weeding. I’m so grateful I could weep, as it then gave me the push I needed to get into another two beds, one of which is now planted with strawberries which have been moved from where they were last year. Then, to my great joy, my Gorgeous got a free afternoon, and spent it digging with me and moving strawberries. I love that man! 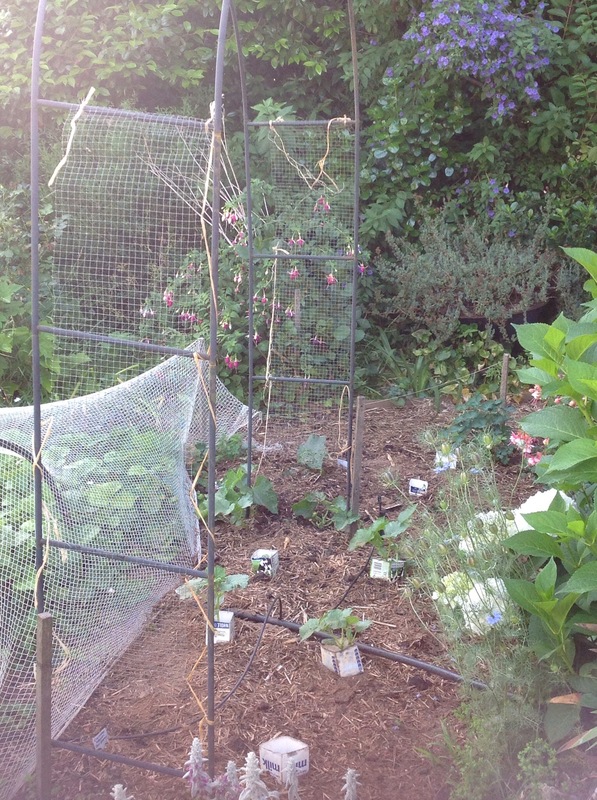 For the last three years I have dug, separated and replanted my strawberries, and the yields have been way up. Last year I had two picks of 1.5kg each, and many more on the other days. I’m much later moving them this year. I know I should have done it a month or two ago, but better late than never, I hope. 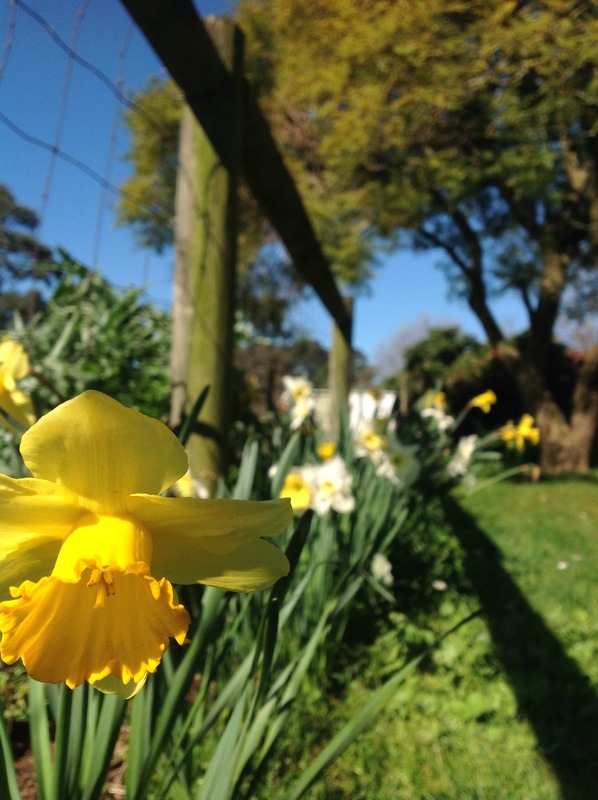 The daffodils are blooming along the old fence line, so it must be spring! 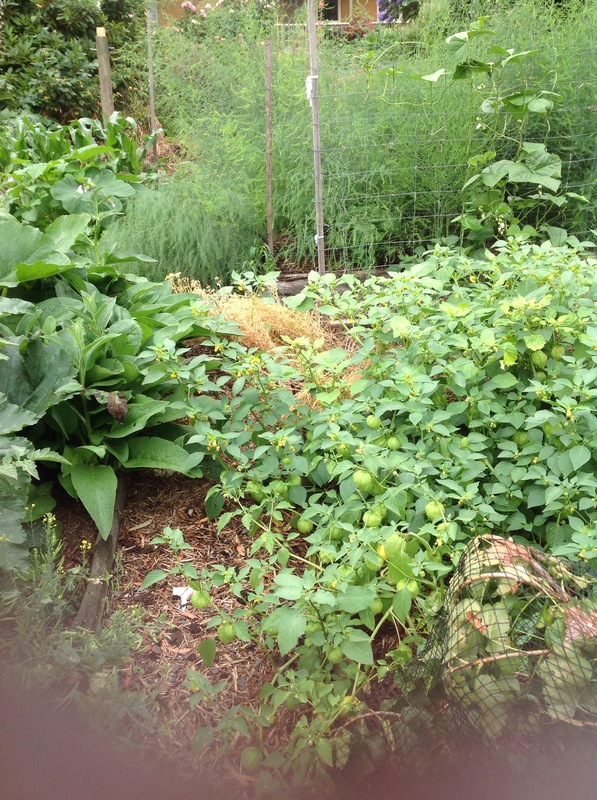 Here’s one of the beds Jenny helped me weed. 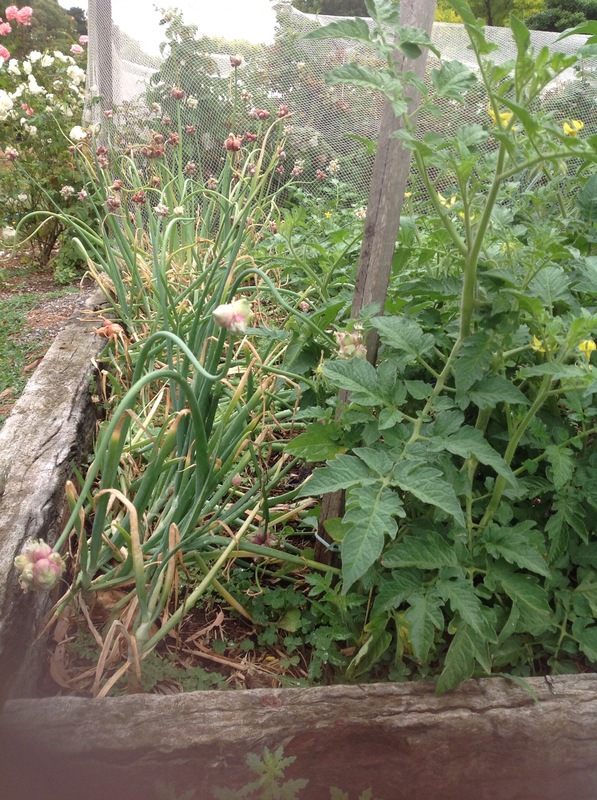 The onions underneath are thriving, and the brassicas are coming along, but not ready to pick yet. I’m trying to decide what to do with these capsicums. In Perth I would have cut them off for another year’s crop. 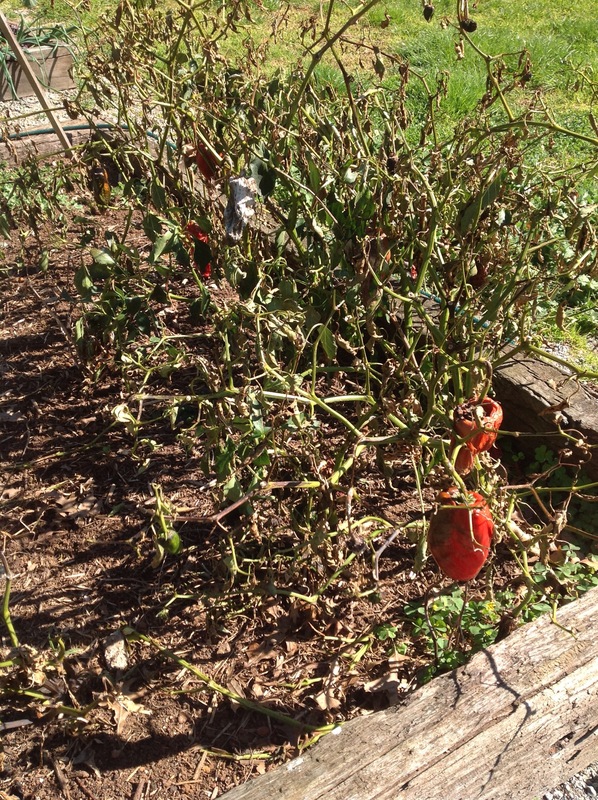 So far they’ve never survived this long here, so I don’t know whether to pull them out, or prune them hard and see. Does anyone else have success in Victoria with keeping capsicums over winter? No matter what state the garden is in, the view is always beautiful. 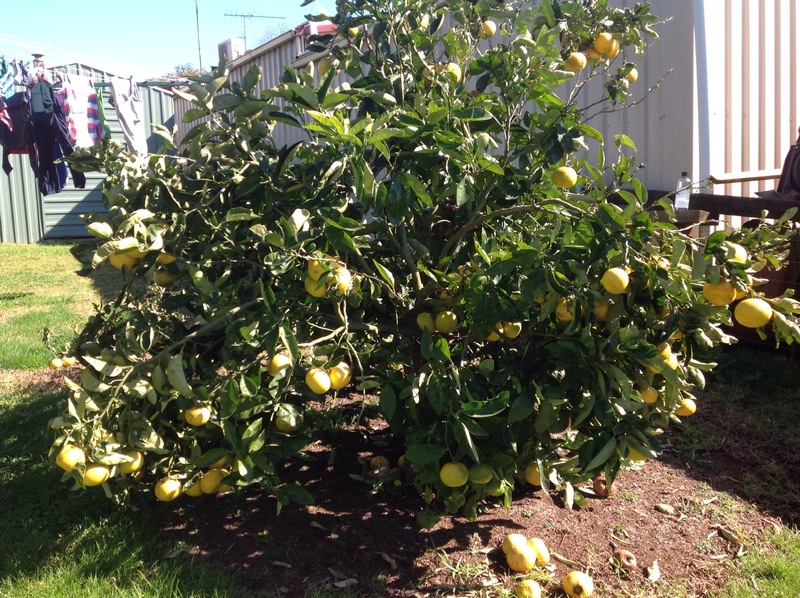 The citrus are in full fruit. 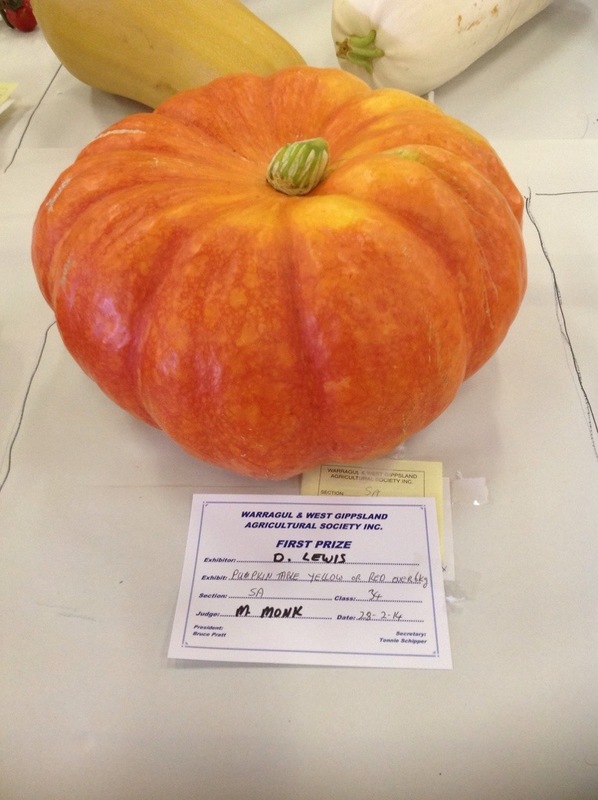 Here’s the grapefruit which sadly lost a couple of limbs thanks to the weight of the fruit, and my lack of diligence. If anybody wants a grapefruit, let me know! 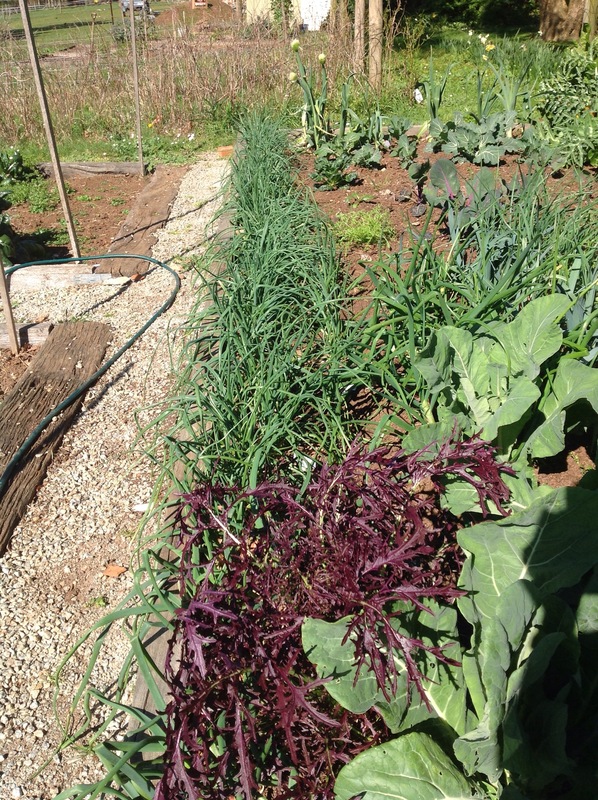 This bed looks great after weeding. 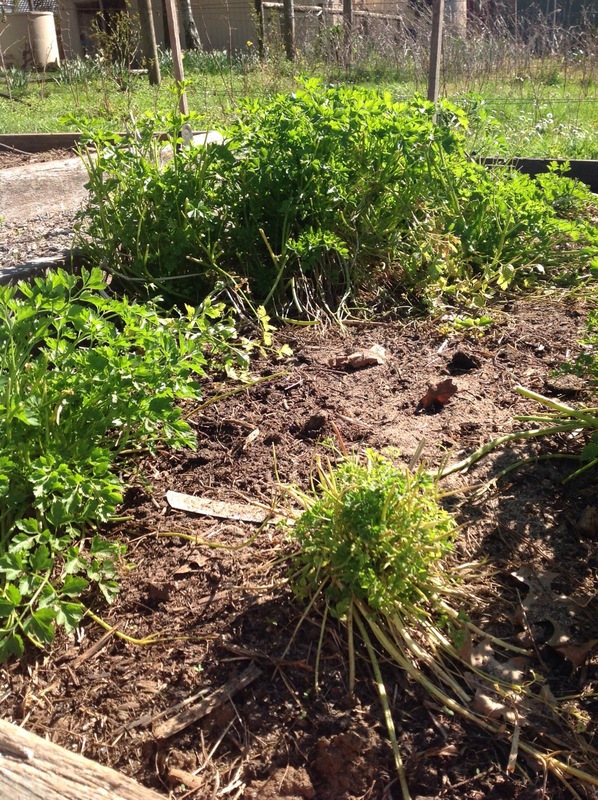 The rabbits haven’t eaten the kale yet, but I was worried that now that the weeds are gone, they’d been able to find them, so I’ve sprinkled lots of blood and bone around just in case. The rabbits definitely HAVE been in the parsley. What a chomp they’ve had. Blood and bone has been sprinkled here also, so I’ll see if the damage stops. I’ve finally pruned my fruit trees, after a talk in church in which the speaker mentioned in passing that he had done his pruning VERY LATE, and since mine wasn’t even done yet, I went straight home and did it. Now I know that wasn’t his point, but I take inspiration where I can! 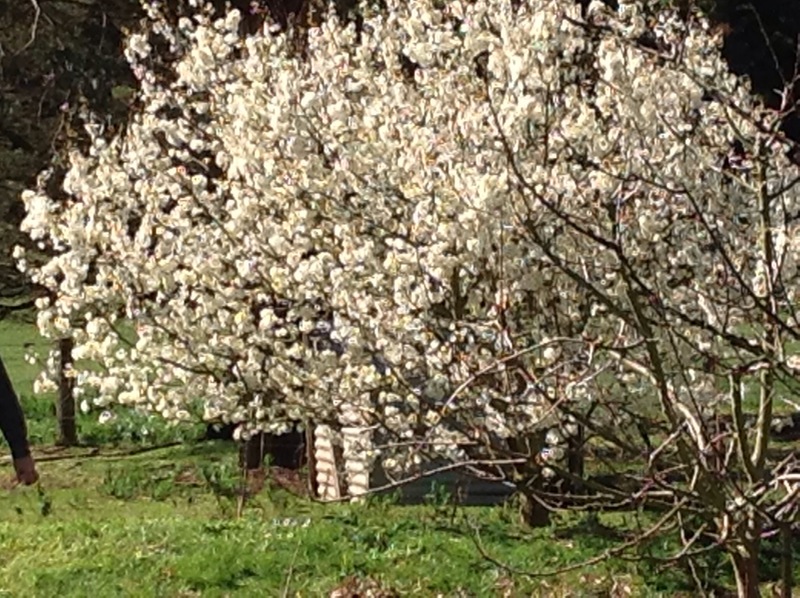 Our satsuma plum is absolutely COVERED in blossom. 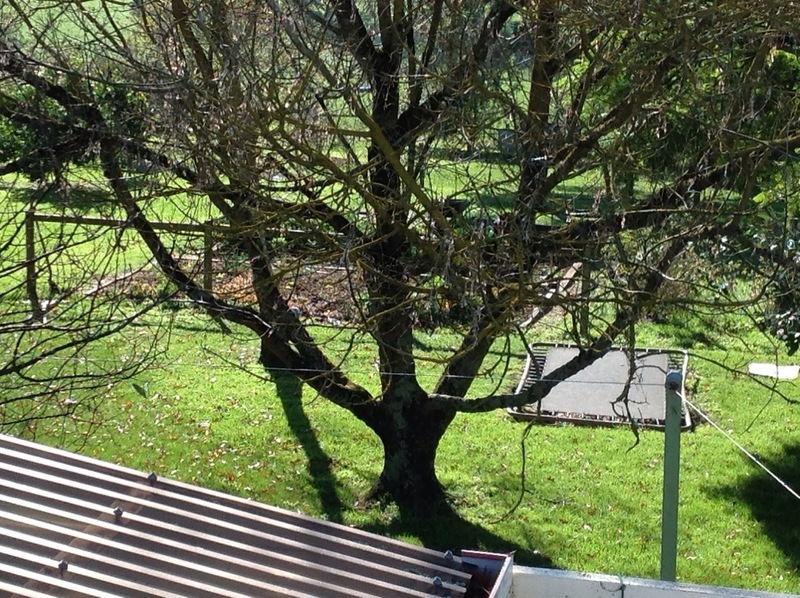 We’ll have either lots of plums or lots of broken limbs if I’m not careful. I’ve been busy in the sunshine planting seeds. 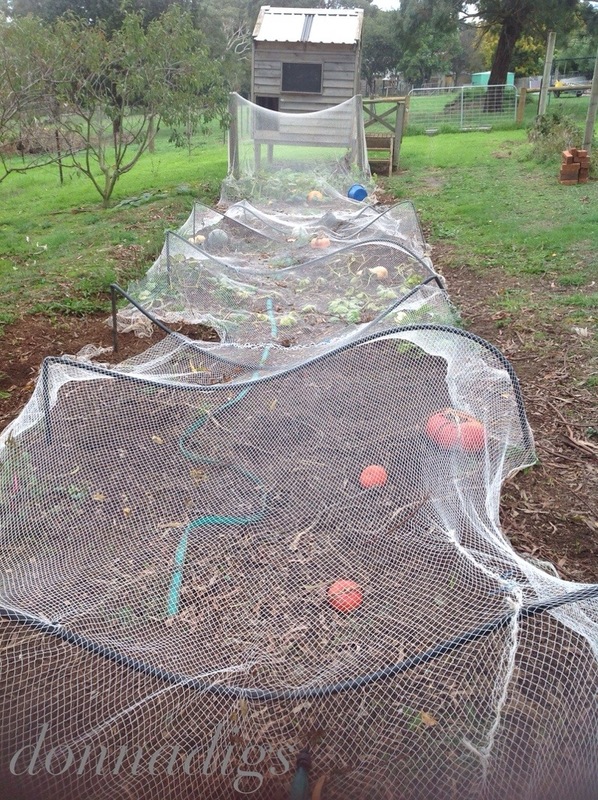 I’ve planted up 60 punnets of summer vegetables including tomatoes, pumpkins and melons, capsicum and chilli, as well as lettuce and other salad greens. 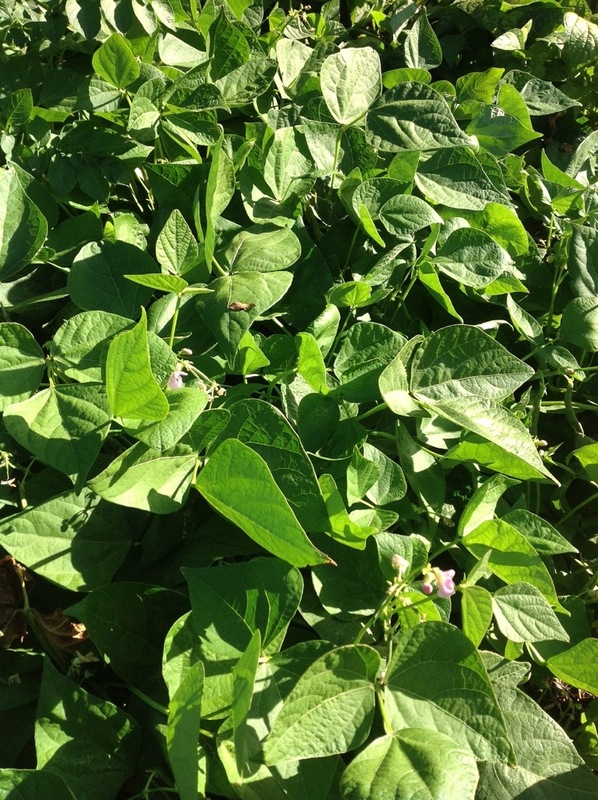 I haven’t put any seeds in the soil yet, but I’d like to put in one more lot of peas while there’s some cool weather left. Is it too late for potatoes? Little Miss Sunny, who is 18, has discovered kale chips, so the kale harvest is going full speed, and they being cooked and consumed by the teenagers (and us when we can get our hands on them) at all hours of the day. We have buckets of citrus -lemons, grapefruit, oranges, limes and mandarins. Still five beds to be weeded. About 400 strawberry plants to dig up and hopefully give away. (Any takers?) lots more manure to add to the garden. That will do for now! 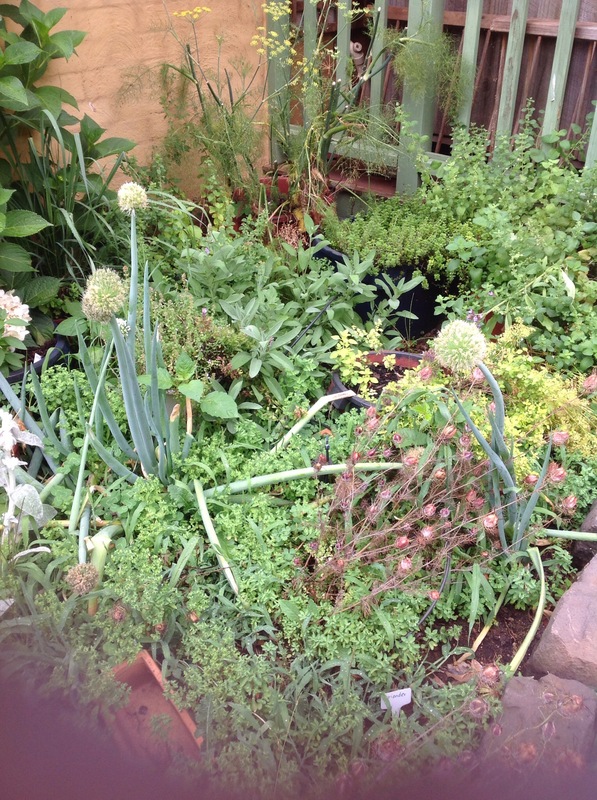 Thanks to Lizzie from the Garden Share Collective for hosting a garden round up. Pop over and have a look at some other gardens if you’re interested. Please, nobody tell Mr Gorgeous, but I have been up on the roof. Not that I’m a stranger to the roof, but I usually go up when someone else is home to either catch me, put me back together or call an ambulance should I fall off. I blame the garden Share Collective. 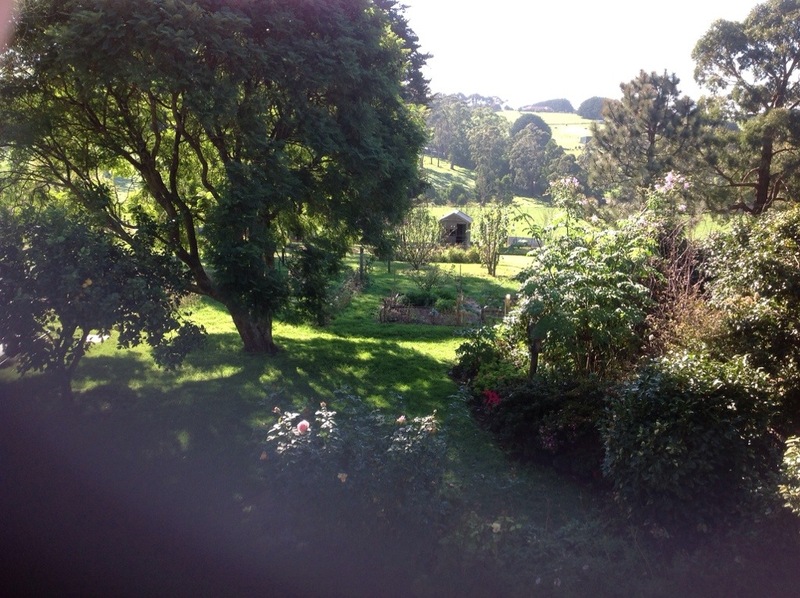 I’m doing my post for June, and there’s not so much happening, so I thought a wide shot would show the garden, and therefore me, in the best light. 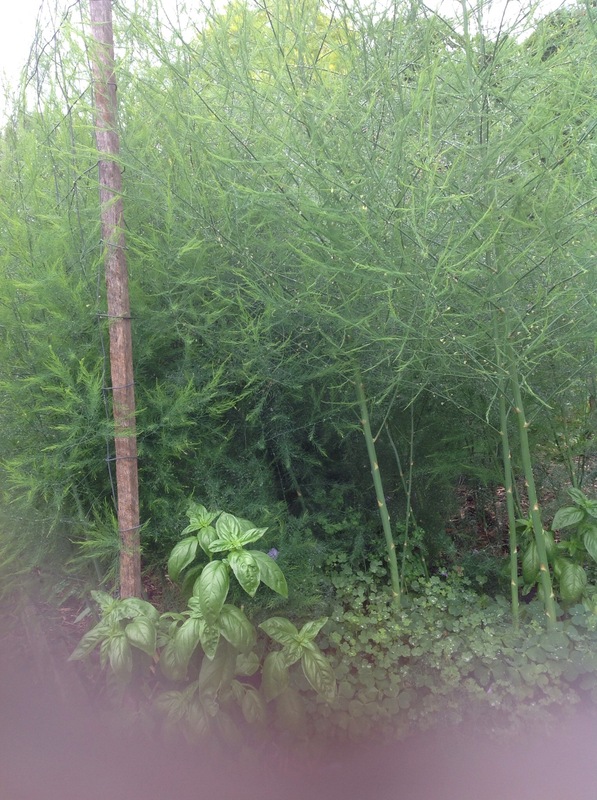 I have three main sections of vegetable garden, and I’ve tried to get a picture of each, although there are quite a few branches in the way. The shed roof would have been better, but I thought that one roof was enough for the day. This month, I will be blogging a quick lick and promise, as I have very limited time, but I hope to have more to tell you next time. Some of everything is in, except broad beans, but I will do some succession planting of lettuce, Asian greens and peas. 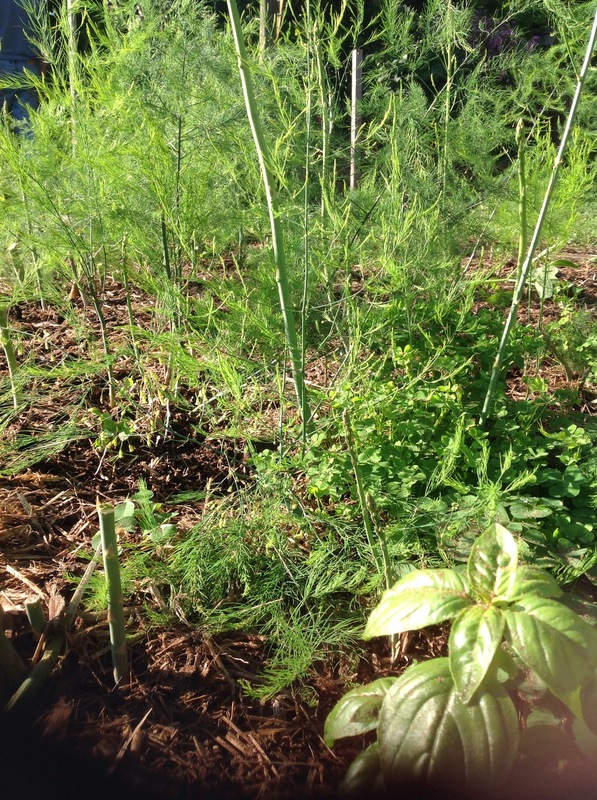 Weed, or mulch. The horse manure we got has a bit of fine grass seed in it, so I’ll need to deal with those babies while they’re small. Not a lot this month. 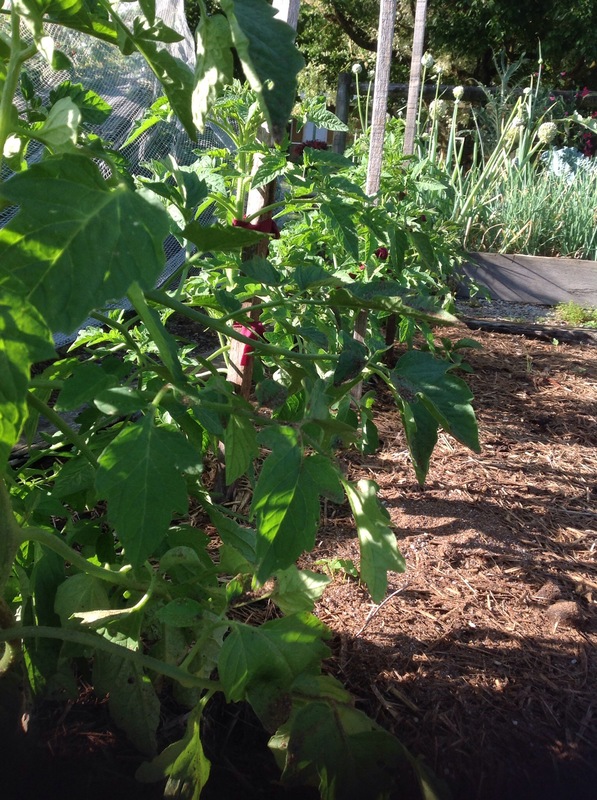 Some late tomatoes, and some capsicum and chili. I also have lots of spinach in various forms. 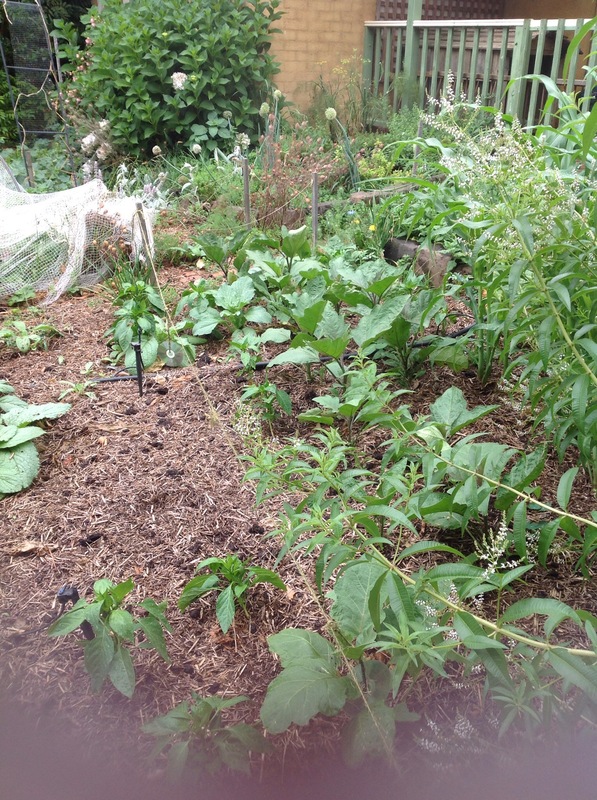 (Warragul greens, silver beet, English spinach). On the other hand, thanks to bumper harvests over Summer, and even before, and my large freezer, I have gone through all of May without buying a vegetable, and I still have some left. I’ve been doing a no shop challenge during May, and frankly, at the end of the month, I still have an embarrassingly large amount of food in the house. I think I’ll keep going for a couple more weeks. So that’s all I have to report for today, but I’ll do better next time. 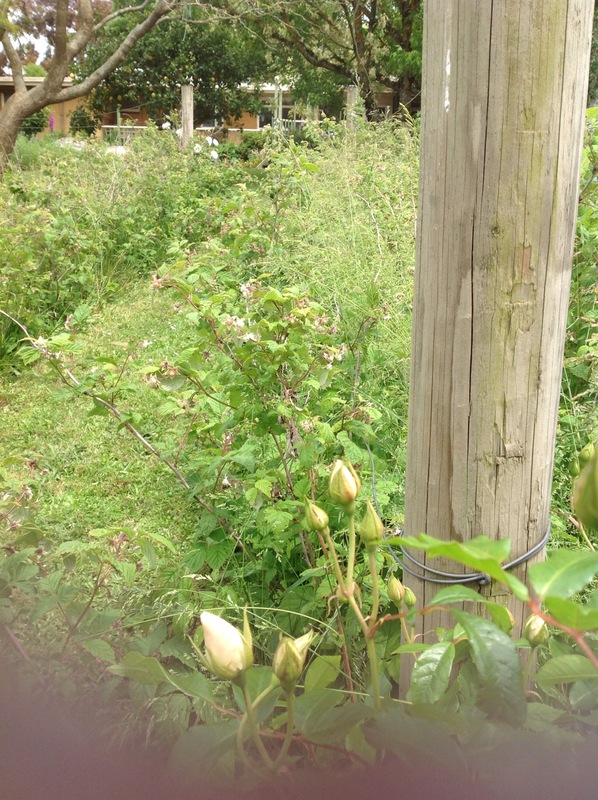 We have decided not to enter our garden in the local open garden this year. The decision has left me a little short for inspiration in the garden, especially with a lot of digging due to be done. 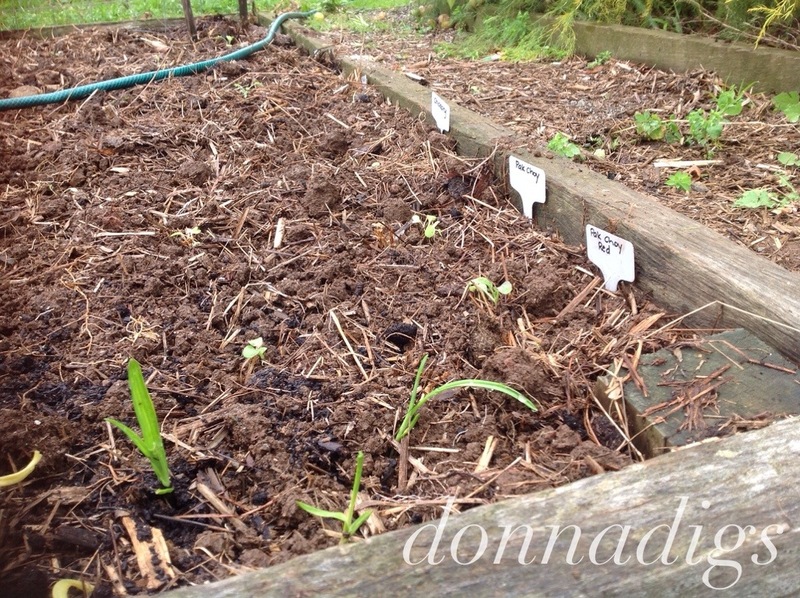 Mr Gorgeous came to the rescue yesterday and dug two beds for me, so I have finally planted some winter crops. 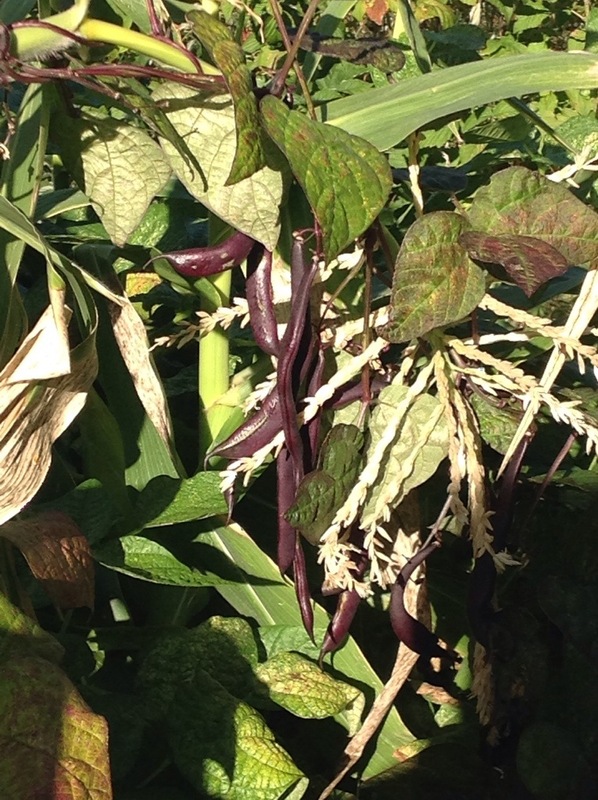 I have however been busy dealing with the harvest, and for those who are interested in what happens to it all, I’m blogging at Donnaisplayinghouse where this month I’m going to have a red hot go at not buying any food for all of May. This is the second time I’ve done this challenge, and it’s been a great way to get towards the bottom of the cupboard, fridge and freezer, and to really be frugal with my resources. I have been most encouraged though by a visit from Linda from Chloe’s Garden who popped in for a look at the garden, and within a week managed to solve my two biggest garden searches. 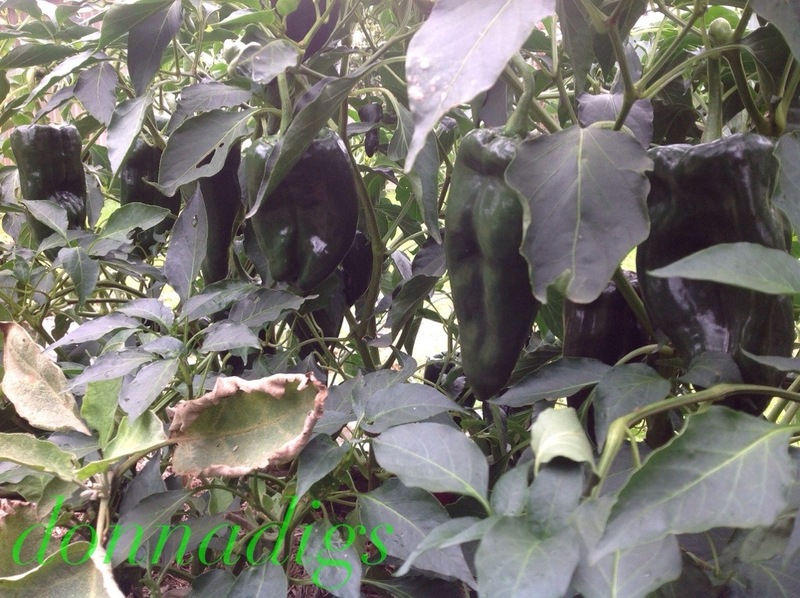 I have been looking for a small capsicum to stuff like they do at the supermarket, and have been growing different varieties for a couple of years in the hope of finding the perfect one. Well, thanks to Linda, I now have seeds! Also, I’ve been wanting to grow tree onions, and again thanks to Linda I have a supply to get me started. What a treasure she is! 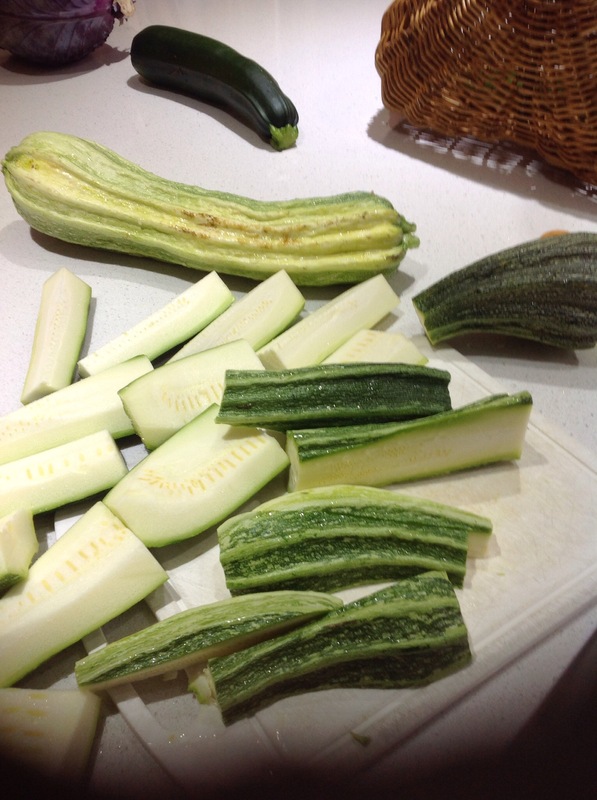 Thanks (and congratulations on the new bub) to Lizzie from the Garden share collective for hosting this blog share, and getting me off my backside and into the garden so I wouldn’t be completely ashamed of myself. 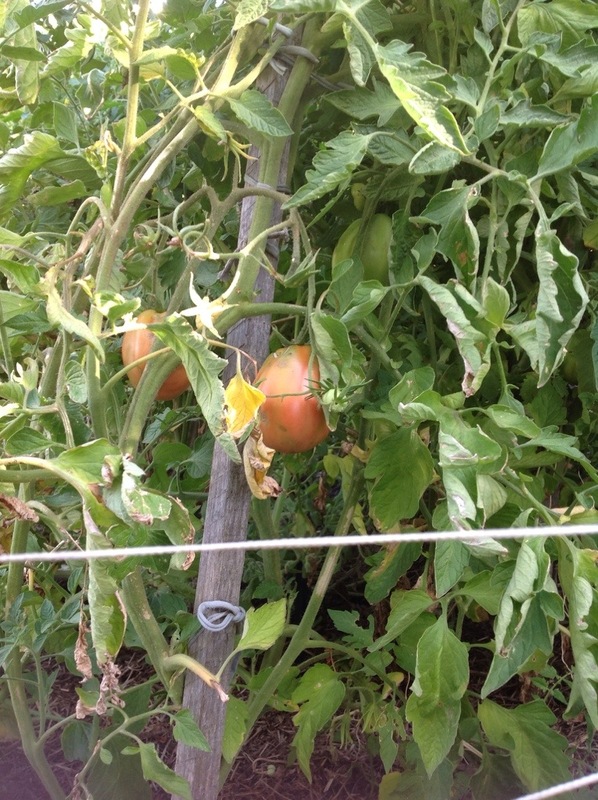 Tomatoes, still, but the quality and quantity are both way down. I got enough for two meals with yesterday, but only a handful were nice enough to eat raw. I oven roasted the rest, half for tea, half for the freezer. Capsicums and chillis. These have been very late bloomers and I hope I get a few more to turn red before the cold weather really hits. 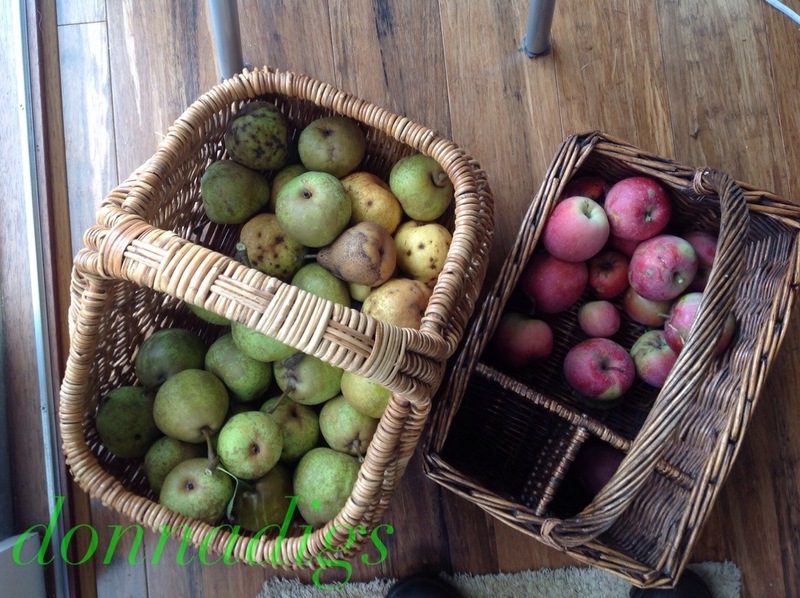 The last of the apples and pears. The pears will mostly be cooked, as the kids don’t especially like this variety raw in their lunch boxes. Beets. Now cooked and ready to bottle, as that’s Mr Gorgeous’s favourite. Lots of brassicas, greens like mizuna and lettuce and chicory and Pak Choy, onions, late beets, garlic, hopefully soon some peas and broad beans. In which the show comes to town! 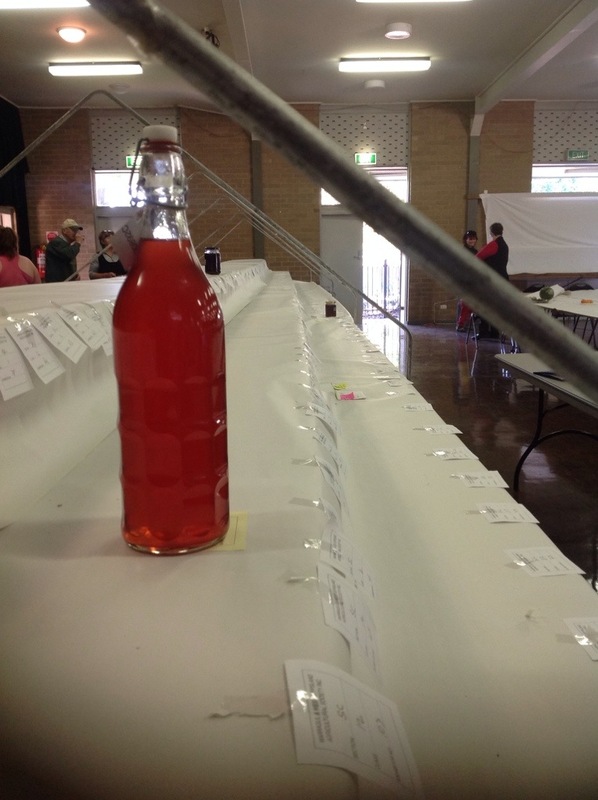 Every year on the first Saturday in March, our local town has a show. 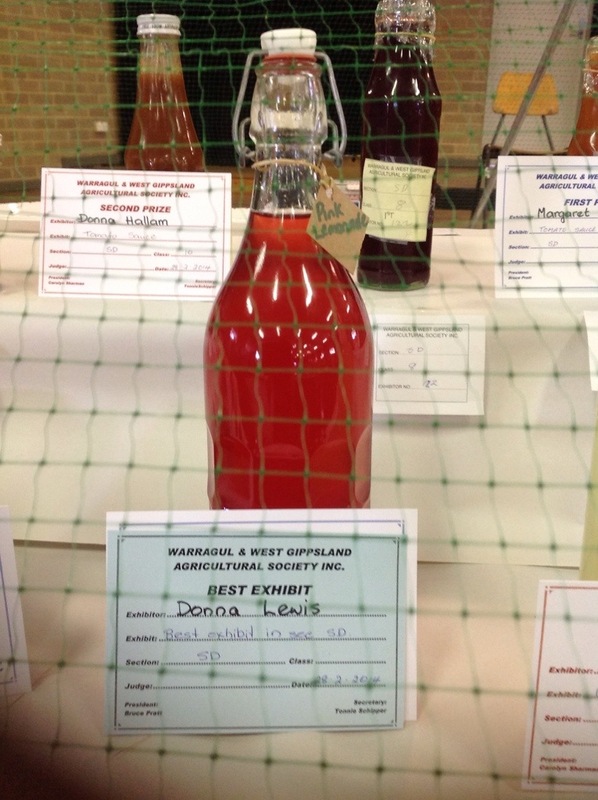 One of the men in charge in the exhibition hall goes to our church, and one year when he was visiting us, he showed me how to pick rhubarb and prepare it for the show. 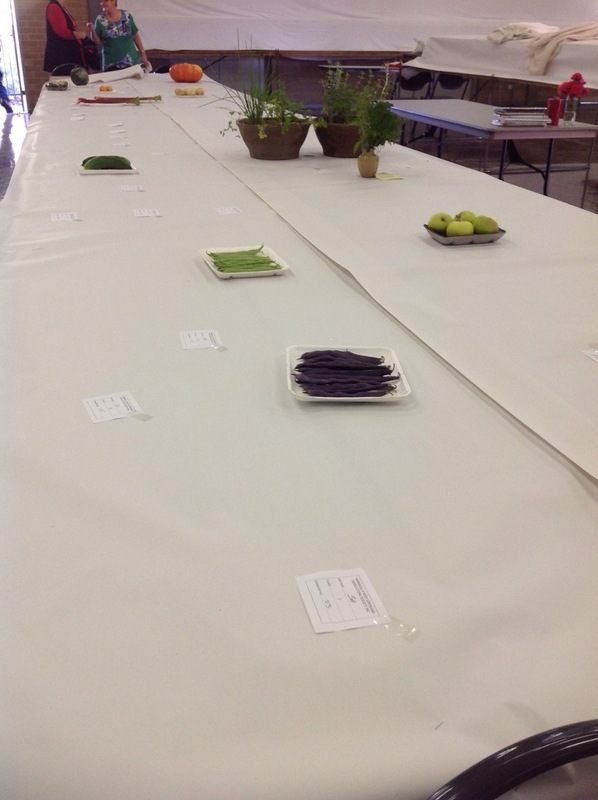 Thus began my association with the show, which now sees me acting as a steward, as well as showing vegetables and cooking. It’s one of those daggy things to do that make the show a really fun outing. Because I’m a steward, I get there really early, so my entries look very lonely for a while. Soon however the shelves fill up. From that point on though, I don’t know what’s happening with my entries, because my area of responsibility is the art section. So, in my acceptance speech, I’d like to thank Mr Gorgeous for his tireless watering efforts in 40 degree heat while I was away. Now, to what’s going on in my garden at the moment. 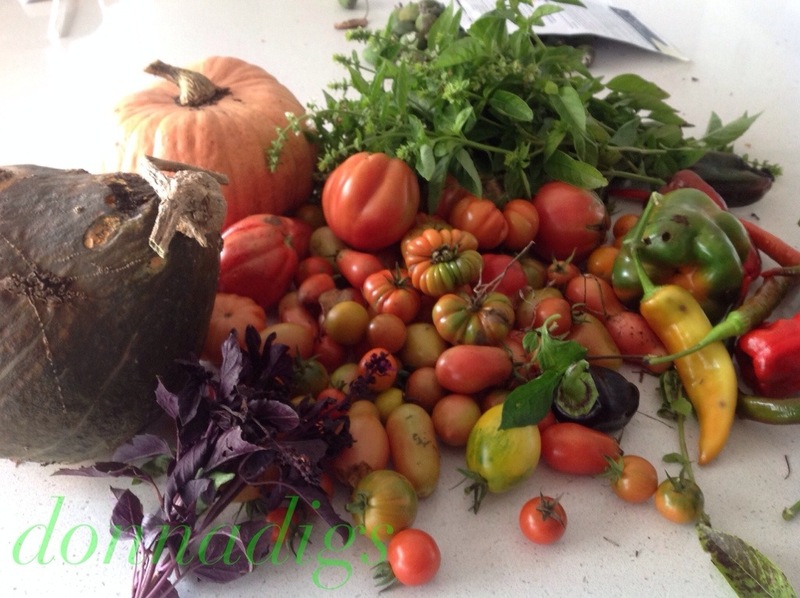 Thanks to Lizzie at the Garden Share Collective for keeping me regularly blogging. There are beans everywhere. 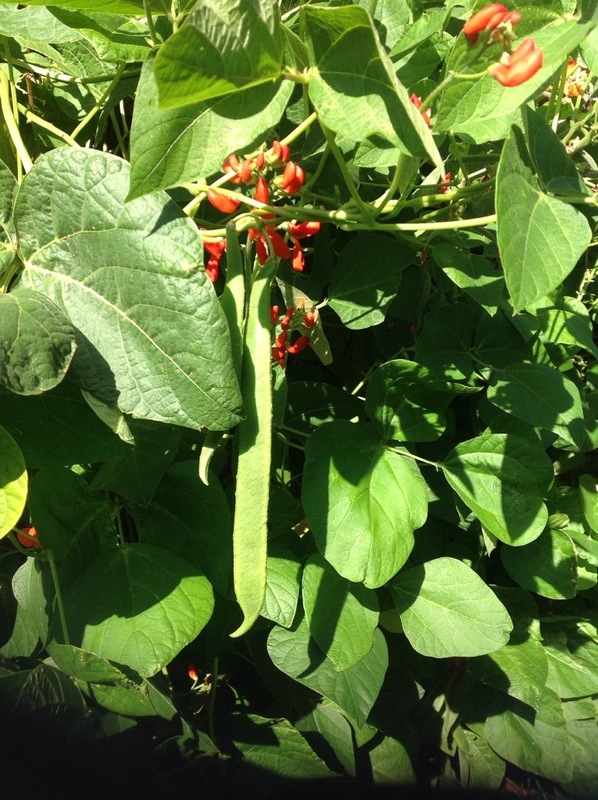 Despite losing all their flowers in the hot weather, the plants have lived on, and are now blooming and producing lots of beans. 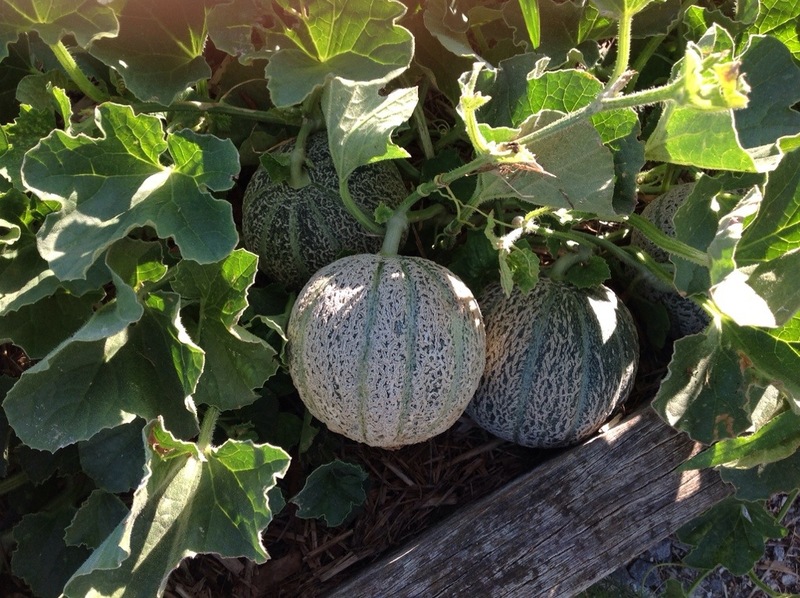 I’ve separated my melons from my pumpkins, thanks to some extra room this year, and finally I’m getting melons. 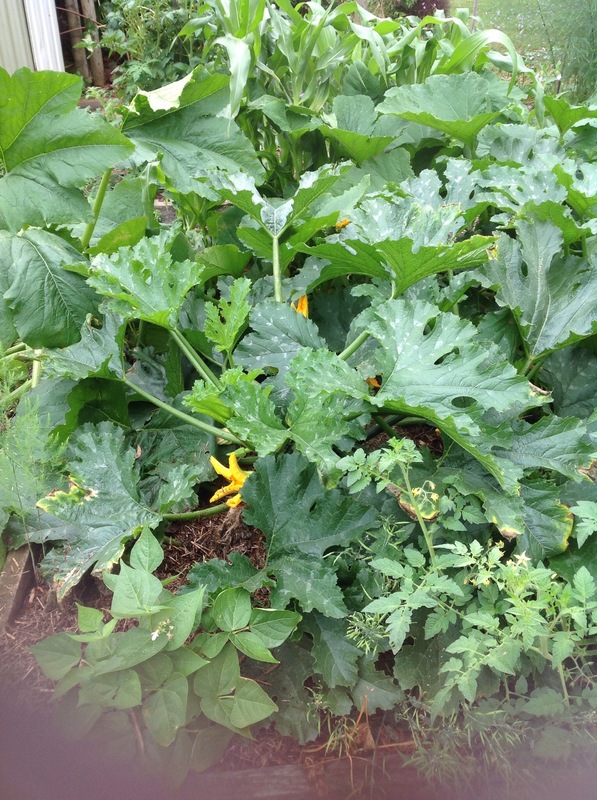 This watermelon (sugar baby, I believe) plant died suddenly, so I’ve been bringing the melons in to eat. They were underripe, but still delicious and refreshing. I haven’t planted anything this month. This will almost certainly leave me with a gap in my produce, but I’ll try and plant a few brassica seeds this week, and some tomatoes and carrots. If it’s not too late, I’d like to put a few more beets in. I get a monthly email from gardenate which tells me what I can plant, although I’m never sure whether I’m temperate or cool climate here. 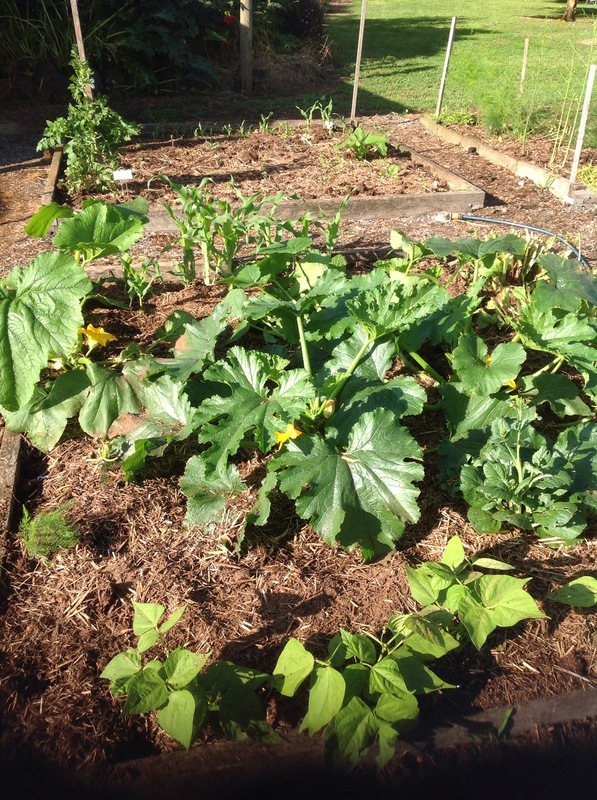 As soon as we get some rain, I need to start some weeding, especially of paspalum and of the strawberry patch. Also, there’s an orange winged bug I need to research to see whether it’s friend or foe. Just as soon as I finish basking in glory…..
Well, this will be a funny old post. I’m writing this from the top room at my mum and dad’s house in Perth. I’m here, thousands of kilometres from my home for my grandmother’s funeral tomorrow, and so I’ll be posting without the usual stream of consciousness flow of photos. First I’d like to do a shout out about my grandma, who was a gardener. Some of my early memories are of happy childhood days spent in her backyard, eating cape gooseberries, pulling apart an old TV in the back shed, cooking jam tarts, sorting the button tin, and answering the dreaded question, “Have you opened your bowels today?” at least once a day, more often if we dared answer in the negative! 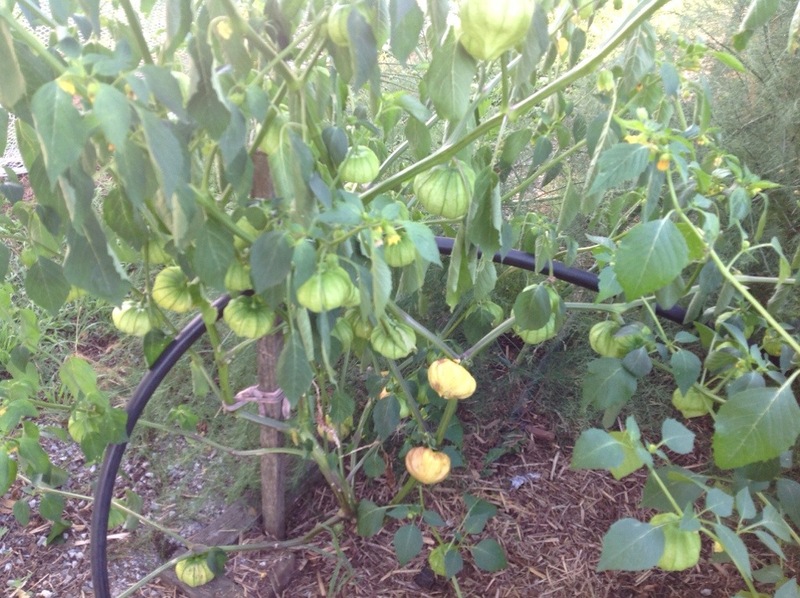 No wonder we spent so much time eating the cape gooseberries. Although she had Alzheimer’s disease of late, and was no longer the cryptic crossword loving quick wit that I grew up with, that lady had been replaced with another lovely gentle lady whom we also loved. So thanks, grandma for the legacy you’ve left our family. And now on to what’s happening in my garden. 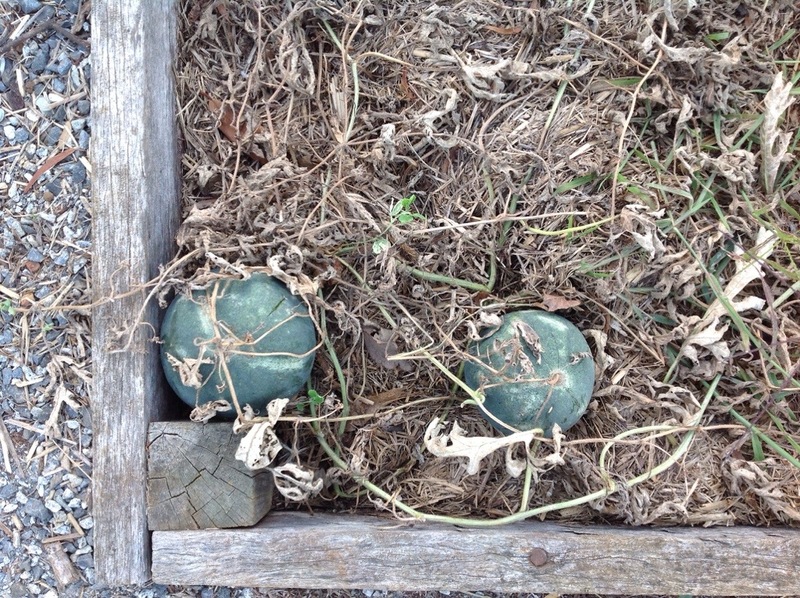 You can read what other gardeners are up to in February here at Strayed from the table. 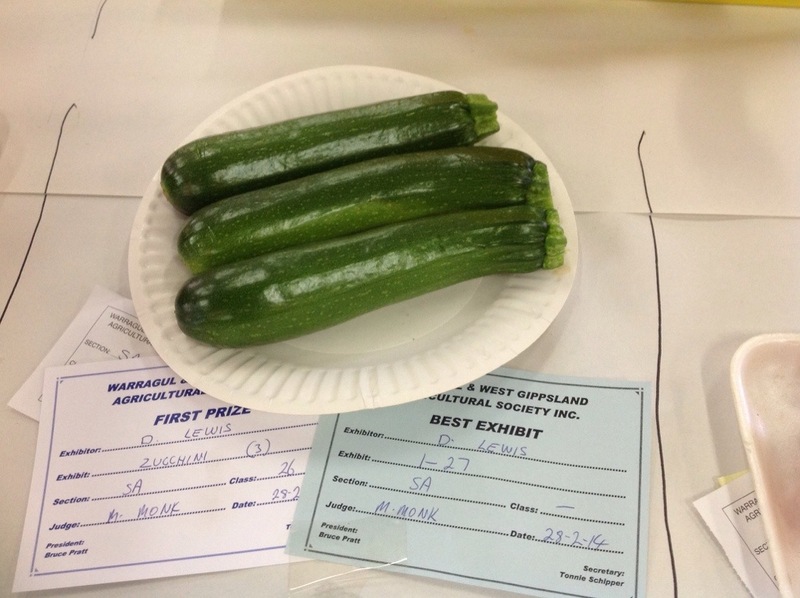 Being February I have mountains of zucchini. I’m making family favourites like zucchini quiche, creating new recipes, and grating and freezing the rest, which is lots. I’ve harvested all the kohlrabi, swedes and parsnips, which I’ve cubed, blanched and frozen for soups. We’re eating beans, kale, and lots of herbs too. The herbs have taken off, and I’m pruning them back to keep them in check. We’ve had quite a bit of hot weather here. The veggies don’t seem to have minded, but many of my flowers have been cooked to a crisp. 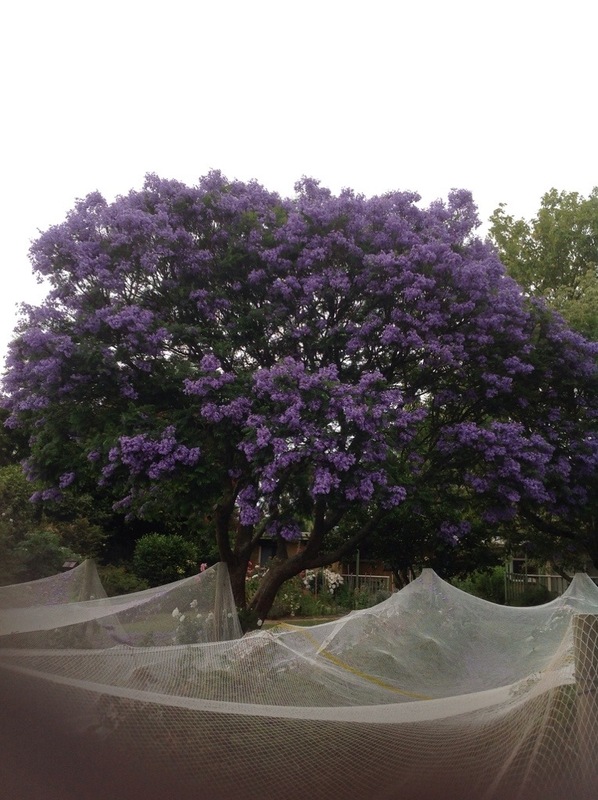 At least the Jacaranda seems happy. We’re getting some autumn raspberries too. I think we’d be getting lots more if we watered them more, but we’re a bit stingy on the water, giving everything only enough to keep it alive. 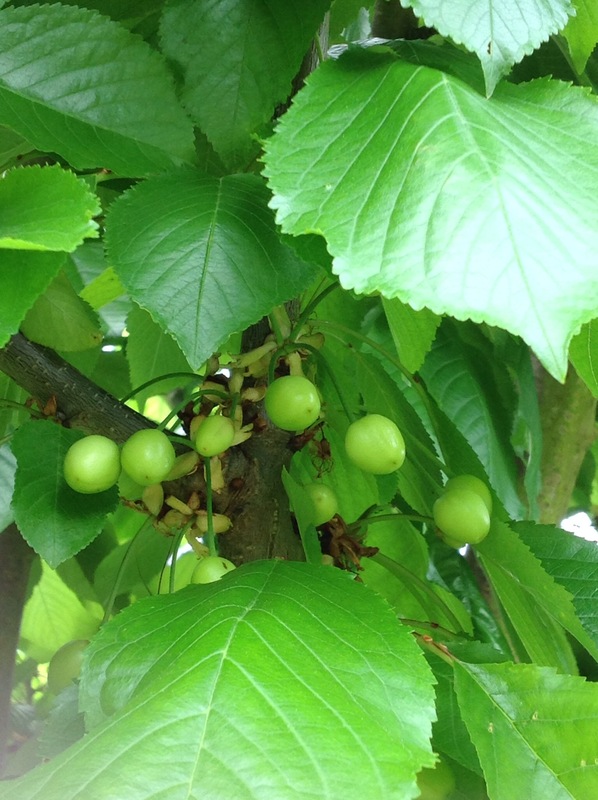 The plums are in full fruit. We’re eating Satsumas this week, with juice dripping down our chins. 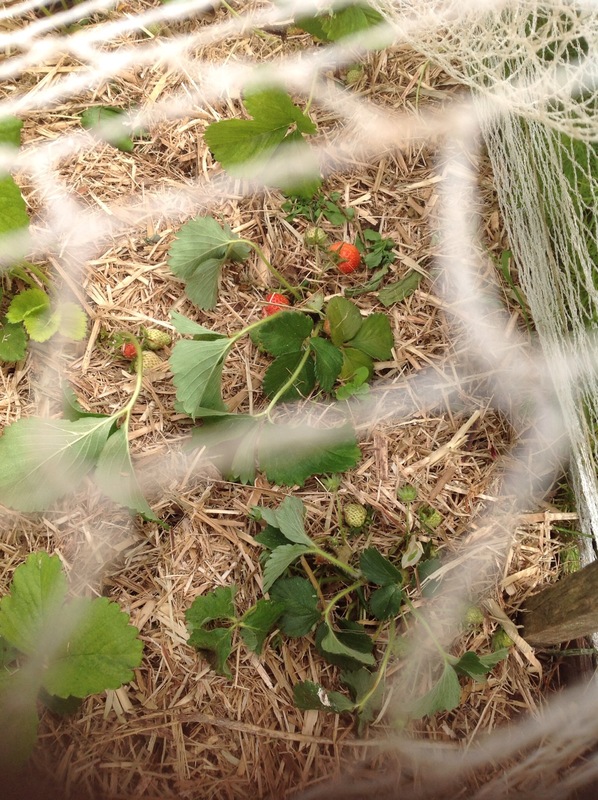 The strawberries are still fruiting, but have slowed down a lot since they started putting out runners. I never know whether removing the runners will help them to keep fruiting or not. Does anyone know? I had a flurry of planting before I flew out to Perth. I put in seedlings of lettuce, eggplant (too late, perhaps) basil, and lots of flowers which will hopefully bloom in time for an upcoming party. 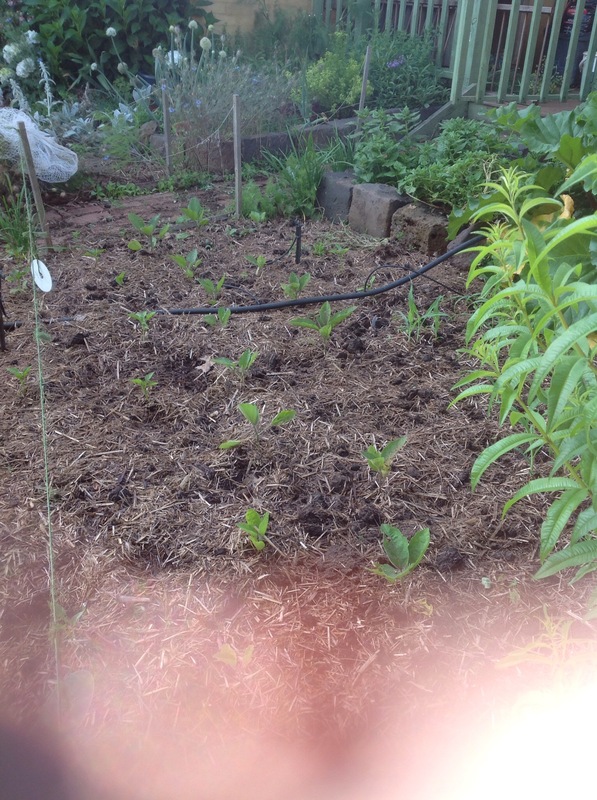 I also planted three rows of beet seeds with the Aunty Collector. 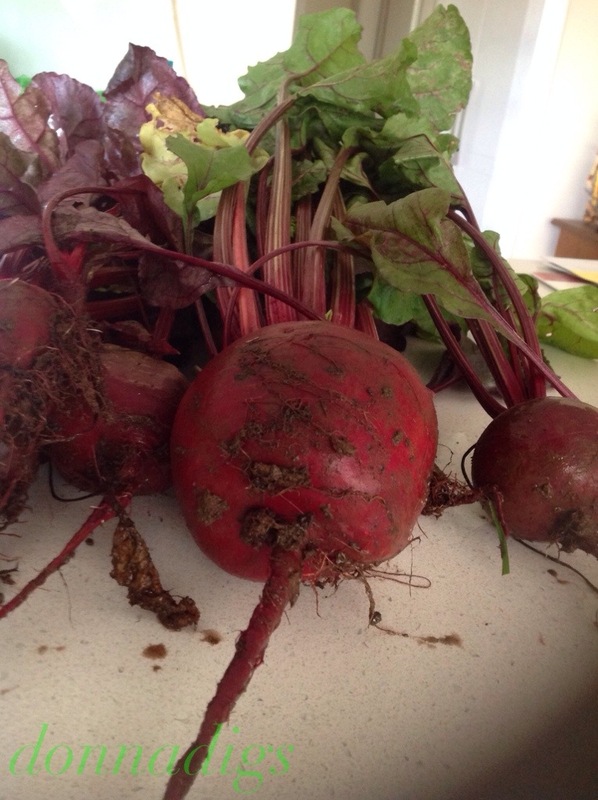 Mr Gorgeous loves beetroot so I hope to be able to present him with lots. Keep everything alive. Mr Gorgeous is doing a great job of watering in my absence. 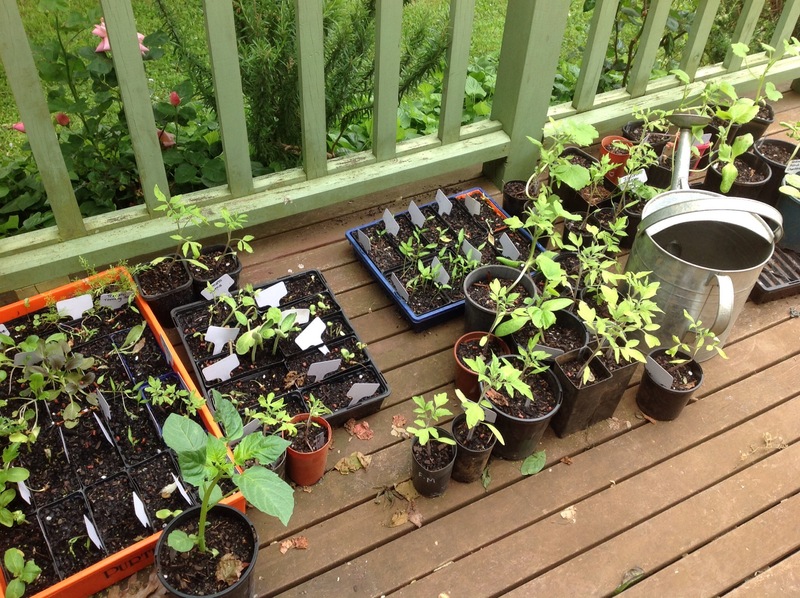 It was 41 degrees yesterday, so it will be quite a job, especially with new seedlings. He is even texting through updates on the watering! 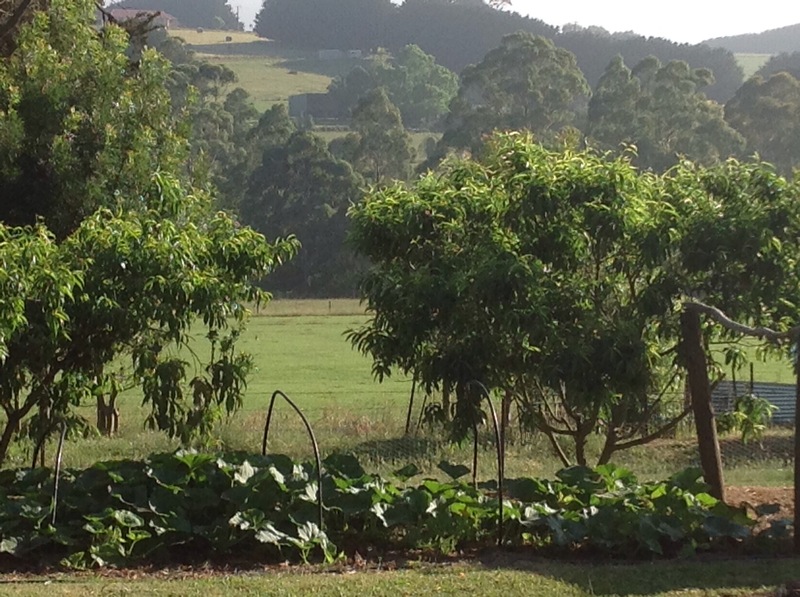 While I’m in Perth, I’ve got two permaculture and self sufficiency books that I’d like to read. 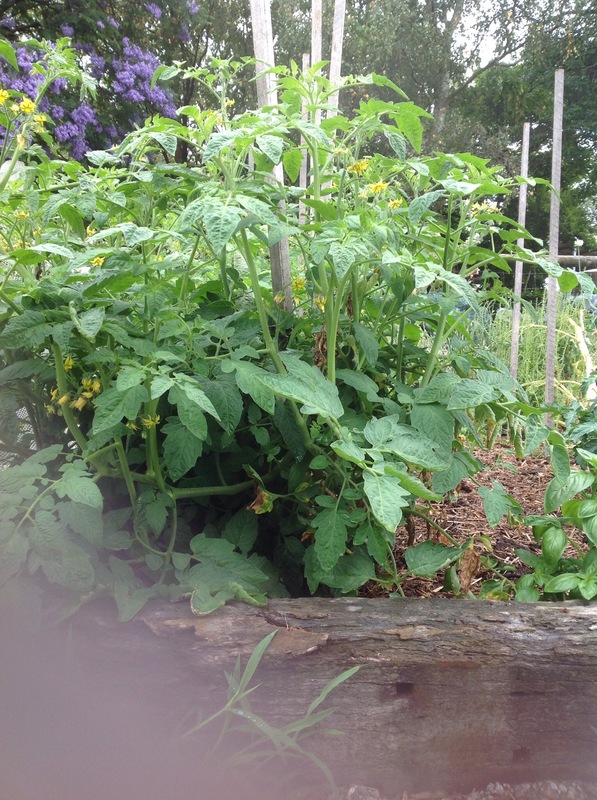 Also, I’d like to tidy my mum’s veggie patch up, as her back is giving her grief, and it’s getting away. Mum’s a great gardener, even coaxing vegetables out of the coastal sand they have here. 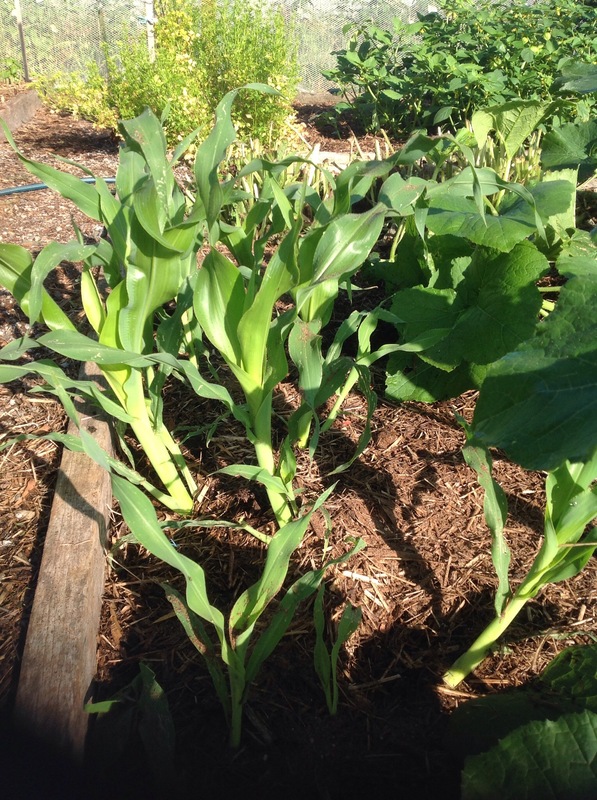 The veggie patch isn’t big, but it’s productive. I’ll try and post before and after shots.